This was not supposed to be this easy. Headed into 2015, the Jackets offense was supposed to cope with its fair share of growing pains. Gone were towering receivers Darren Waller and DeAndre Smelter, powerful B-back Zach Laskey and All-ACC guard Shaq Mason. Paul Johnson had good reason to be confident in their replacements — all four successors, after all, had two years of experience in The Flats — but it would surely take time for the offense to return to its prolific form of yesteryear. Two games into the season, though, it’s apparent that new faces haven’t weakened Tech’s attack: if anything, they’ve made it stronger. It is unwise to put too much stock into statistics from a team’s first two games, particularly when it is favored in both by a wide margin. Nevertheless, Justin Thomas and his teammates have moved the ball with superb efficiency and scored with ease thus far. Tech places second in the nation with 64 points per game, trailing only SEC powerhouse Ole Miss. The Jackets are also one of only 14 teams nationally that are averaging over 550 yards per contest. To put these numbers in perspective, the team’s 2014 counterpart played a similar opening slate — a home matchup versus Wofford and a road trip to Tulane — and averaged 38 points and 434 yards per game. While impressive, that pales in comparison to the Tech offense’s efforts through two games this year. Perhaps the most interesting statistical takeaway from the first two games is the Jackets’ newfound ability to score through the air. Last season, the quarterbacks combined for 19 passing touchdowns. If the current trend continues, they’ll throw 24 in 2015. Justin Thomas mentioned after the game that “when we throw the ball, we expect big plays, and that is what we got today.” It’s unlikely that Tech will ever be confused for the prolific pass attack of Washington State or Oregon, but any opportunity to force opposing defenses out of the box is one that the team will gladly take. The success hasn’t been limited to starters. After the outcome of the game was decided, freshman Matthew Jordan announced his arrival with a 35-yard touchdown to TaQuan Marshall to finish a nine-play drive, showing that the Tech offense can hum along without its two best signal-callers, with Tim Byerly having missed the game after suffering a knee injury in practice. Likewise, backup A-back Qua Searcy has turned heads early on with his game-breaking acceleration and pass-catching ability. Thomas was effusive in his praise of Searcy after the Tulane game, noting that “it is fun… just knowing that you can get the ball in [Searcy’s] hands like that, and he will make a play no matter what.” Both players demonstrate the potential stashed away on a deep offensive unit. On his part, Coach Johnson was nonchalant when asked about the effect of new personnel on the offense. 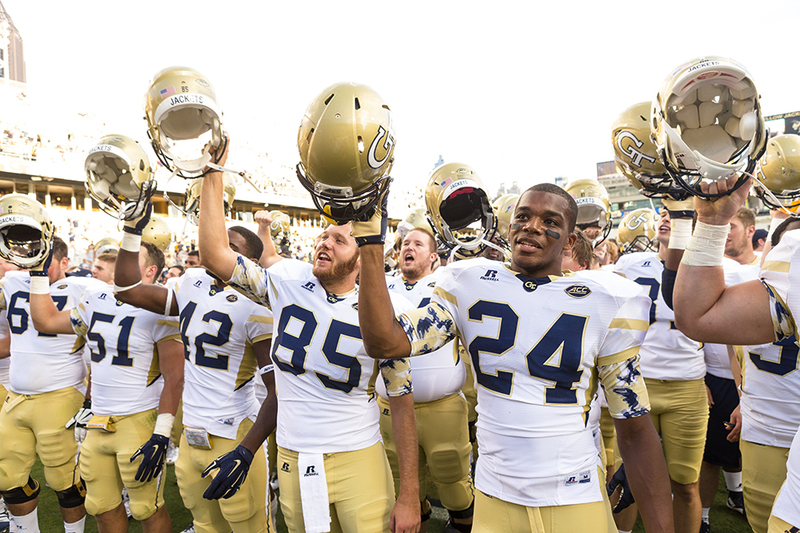 Coach Johnson expects his team to execute, and so far the Jackets have done just that. Putting up the numbers they have, even if they were against small schools, should be a good indication of what fans can expect going forward.